Remote monitoring programs help physicians and nurses ensure continuity of care for elderly patients with chronic conditions. The goal is to catch problems early and improve self-management. Another goal: provide physician reimbursement. An elderly woman with heart failure steps on a scale in her home. Her weight registers both on the scale and on a computer in her doctor's office, which compares the current number with past trends and preset parameters. If the result raises any red flags, a nurse calls the patient to determine what might be causing her weight change. The nurse reminds the patient to cut back on sodium or take her medication, averting a potential hospitalization. 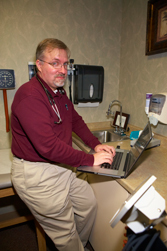 This scenario is a current reality for patients participating in remote monitoring programs. Targeted mainly at elderly patients with chronic diseases such as congestive heart failure, hypertension and diabetes, these programs put some basic measuring equipment, including scales, blood pressure cuffs or heart rate monitors, in patients' homes. Through phone, broadband or wireless service, the equipment is connected to a monitoring health care provider. 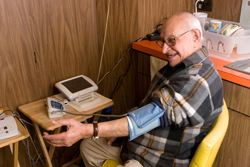 Ralph Terenzio, a patient with the Center for Connected Health, checks his blood pressure using remote monitoring equipment. The goal is to catch problems early and improve patient self-management in order to reduce the need for office visits and hospitalizations. But the technology has to overcome some hurdles to widespread implementation, including still-limited infrastructure and a lack of physician reimbursement. Because computers handle much of the data collection, remote monitoring doesn't require significant nursing time but achieves the same benefits of fewer hospitalizations and less physician time. Research indicates that chronically ill patients who need a lot of follow-up require fewer office visits if they're involved in telemedicine, said Joseph C. Kvedar, MD, the founder and director of the Center for Connected Health, a research division of Partners HealthCare in Boston. Results from remote monitoring pilots and programs around the country have confirmed some of the potential benefits, but the findings have also highlighted the hurdles that prevent the technology from being more widely used today. The Veterans Administration runs one of the largest remote monitoring programs. Originally begun as an 800-patient pilot in 2003, the program now monitors more than 40,000 patients across the country. Similar statistics have been shown by other remote monitoring programs, including one conducted by the Center for Connected Health. “The biggest success we've had is with congestive heart failure, where we've been able to consistently show up to a 40% decrease in admissions,” said Dr. Kvedar. Reduced admissions can lead to major cost savings. “Each time one of those people stays out of the hospital, that's a savings of 10 or 12 thousand dollars, so it's easy for us to justify the program,” Dr. Kvedar said. Not surprisingly, that calculation led to some concern among nurses about computers replacing humans. “Some nurses initially get nervous and think, ‘They're going to replace all my visits,’” said Mr. Farber. However, the success of remote monitoring is based on person-to-person communication, the experts said. The programs have achieved their results by combining new technology with existing principles of patient self-management. The regular feedback of monitoring improves patients' understanding of the connection between their actions and their condition. 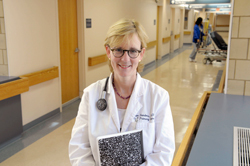 “It draws patients into their own care and holds them accountable,” said Dr. Kvedar. The sense of accountability is made concrete when monitoring nurses follow up on abnormal results. “Once they find out that someone is actually looking after them and is interested in them, they start to become more and more compliant,” said Mr. Farber. 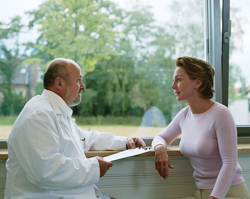 Remote monitoring also helps deal with problems that could cause a patient to be nonadherent. For example, if the neighbor who usually helps a patient with his insulin is sick, and a nurse learns of the problem from a high blood glucose reading and the resulting phone conversation, the nurse can help organize an alternate arrangement. “Often what the care coordinators do is not really absolutely the fine tuning of the management of diabetes. It's often those elements of self-management,” said Dr. Darkins. Of course, sometimes a change in the patient's condition requires a more clinical response. In many of the programs, physicians typically view summary monitoring data during patient visits, but the nurses can also get them involved when there's an immediate problem requiring attention. For example, if a patient's blood sugar has been consistently high, the nurse may recommend increasing the insulin dose. “It allows the others on the care team to do a lot of legwork and present the doctor with data that promotes accurate and efficient decision-making,” said Dr. Kvedar. Before they've tried it, many physicians are concerned that the technology will swallow time instead of saving it, but the programs are set up to be efficient, Dr. Kvedar noted. “We take great pains to design these user interfaces for the doctor so that they don't get reams and reams of meaningless data thrust at them. The software pulls out data points that are of interest to them.” For example, the computer may point out that a patient's blood sugar or pressure goes up at a particular time of day. Although the software on the inside gets ever more complex, remote monitoring is by necessity very simple on the patient's end. “In one of our clinical settings, which I think is probably very typical, 40% of the diabetic patients that we're putting on the program don't use a Web browser,” said Dr. Kvedar. The obstacles can be logistical or psychological. “While most of the residents were able to implement the devices, we did have a minority of patients who were simply unable to effectively manage them and some who felt it was just too intrusive,” said Matthew J. Narrett, ACP Member, executive vice-president and chief medical officer of Erickson Retirement Communities. Erickson's experience with remote monitoring points to some of the limitations of the technology. As part of a pilot with computer company Intel, remote monitoring systems, which included measurement of blood pressure, weight and glucose as well as a video conferencing feature, were installed in the homes of independent living residents in Erickson Retirement Communities in Maryland. There were some positive outcomes. One patient had a low blood pressure reading, which prompted a call from the nurse and ultimately led to a diagnosis of a mild stroke. However, at the end of the pilot, administrators at Erickson decided to discontinue use of the system. “We don't feel that it added enough value to our current health care system to justify the purchase of the devices,” said Dr. Narrett. Another concern, which has been more widely shared by others using remote monitoring, was liability. “At night and on weekends, when patients continue to enter data into an electronic system, who's going to be there to review the data and intervene in a timely way?” asked Dr. Narrett. All of the programs teach participating patients that remote monitoring is not always timely and should not be used for an acute medical problem. “This is a system for monitoring your chronic illness, not in real time, and it's not a substitute for calling 911,” said Dr. Kvedar. His malpractice carrier is on board with the system, and health care consultant Vince Kuraitis predicts that others will soon follow. “Imagine the doctor on the witness stand. Today, the question is ‘Why did you try this newfangled remote monitoring system?’ The question a few years from now is going to be ‘Why didn't you connect to this system?’” said Mr. Kuraitis, the founder of Better Health Technologies, LLC. The physician reimbursement system is the major economic barrier. The major users of the technology thus far have been health care organizations, such as the VA and Partners, that benefit financially from a reduction in office visits and hospitalizations. For an independent physician practice, remote monitoring is less likely to offer a financial benefit and perhaps may even lead to a loss, if some office visits are replaced with data review and phone calls. “There really does need to be some allowance for reimbursement for this activity. It needs to be paid for, and it should return to the system if you really are improving outcomes and reducing hospitalizations,” said Dr. Krumholz. Additional rigorous evaluation of the various remote monitoring systems (which may not all be equally effective) is needed, so that clinicians can be confident about what the programs achieve, he noted. So far, cost-effectiveness data on the programs are limited but encouraging, Dr. Krumholz said, and the value will increase as the cost of technology continues to drop. Payment system reforms that incorporate pay-for-performance or bundled payments could increase the value of remote monitoring for physicians. Meanwhile, existing incentives to increase use of health information technology make it more likely that doctors' offices will soon have the computer technology to plug into remote monitoring systems, the experts suggested. As the population ages and more tech-savvy patients have need of monitoring, the technological options will also open up. “Everyone who's in their 50s now who's going to be a high health care consumer in the next 10 years, they're all connected to computers,” said Dr. Kvedar. Many of the current monitoring systems use analog phone lines, because that is the only connectivity in patients' homes. But the elderly of the future could be inputting their data into smartphones. It all adds up to the likelihood that you'll be monitoring a patient not-so-near to you fairly soon, experts predicted. “Remote monitoring technology will be an integral component of the medical home and helping doctors to coordinate care and be paid for it. When all those things come together, doctors are going to love this technology,” said Mr. Kuraitis.